The PEW Research Center has released a report (2nd April 2015); which gives the projections of populations in times to come. 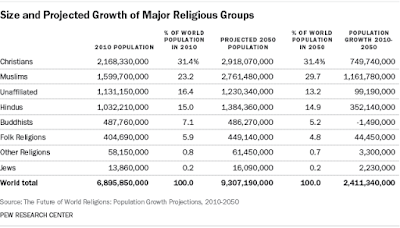 It says that in India the population of Hindus will fall down from present 79.5 % to 76.7% and the Muslim population will rise up to 18% by 2050. 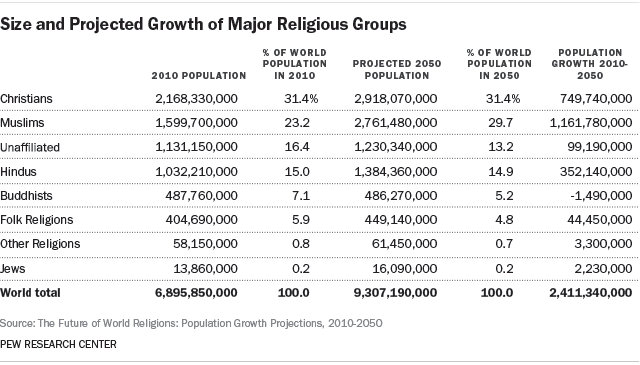 The population of Indian Muslims will overtake the population of Muslims in Indonesia and Pakistan. Disturbed by these projections Sadhvi Prachi advised that Hindu women should produce 40 children each while Sakshi Maharaj, BJP member of Parliament advised four children each for Hindu women. Time and over again many a leaders from Right wing Hindu formations have been advising the Hindu women to serve the ‘nation’ by producing more children, and interestingly the celibate ones’ amongst these advisers are more vociferous on these matters! Given that these projections may be close to the reality, how do we explain the rise of Muslim population in India, is it due to Islam? If it is due to Islam than logically the countries ahead of India (Pakistan and Indonesia) should keep the same pace and remain ahead of India as far as population of Muslims is concerned. How come the number of Muslims in India will overtake the number in other countries, if Islam is the reason? Simply this totally smashes the argument of religion being the determining factor in matters related to population growth. Within India itself; one obverses that there are serious regional differences between areas like Malabar Coast of Kerala and the UP-Bihar region. Even in the strife torn Kashmir valley one noted in earlier decades that the percentage of increase of Hindu population was more than that of the Muslims in the valley. The second argument is that Muslims don’t take to family planning as their religion prohibits them so this increase. In his book 'Family planning and legacy of Islam' Islamic scholar A R Omran of Cairo dispels the myth that Islam is inherently against family planning, as per him there is no text in Koran prohibiting prevention of pregnancy. In Islamic countries like Turkey and Indonesia family planning methods are quite popular. In Turkey for example 63% of the population in the reproductive age group uses contraception and in Indonesia the figure is 48%. In India the number of Muslim couples in the child bearing age practicing family planning in 1970 was 9% (Hindus 14%) and in 1980, 22.5% (Hindus 36.1%) (Operation Research Group: Baroda 1981) Thus the number of additional Muslims taking to family planning is keeping pace with the number of Hindus doing the same. Dr Rakesh Basant, an economist with IIM Ahmadabad and a mem­ber of the Sachar committee, points out that at present "there is (only) a 0.7-point difference between the Muslim and the average fertility rates. While the average fertility rate is 2.9, for Muslims it is 3.6." He emphasizes that 37 per cent of Muslims use contraceptives against a national average of 48 per cent. Therefore, contraceptive usage is about 10 percentage points lower among Muslims than the average. However, there are significant regional variations. The report observes, contraceptive usage goes up with education and development and all communities benefit from such changes. So where do we look for answer to this puzzle of Muslim population rising more than that of Hindus in India? Just let’s have a look at the regional differences in the population growth of Hindus in India. Here the gross observation is that in the more literate Southern states like Tamil Nadu, Karnataka and Kerala the rise in the percentage of even the Hindu population is less than the percentage rise of Hindu population in the northern states like UP, Bihar and Madhya Pradesh. As far as the figures in India are concerned large number of Muslims lives in the ghetto like situations or in the outskirts of cities, and is on the lower side of the income profile. As the much discussed Sachar committee report points out the marginalization of Muslim minorities in employment and major business opportunities has led them to a condition of economic downslide or stagnation at best, not keeping pace with the overall economic growth which the country has witnessed. This lack of equity has worsened due to the communal violence, which has led to their insecurity and ghettoisation. These two phenomenons have made them vulnerable and they have become more susceptible to the influence of conservative maulanas advising against the family planning etc. The large section of Indian Muslims are coming from the background of untouchable Shudras, whose economic starting point has been very low, this added on by the lack of affirmative action for them and the physical insecurity has led to the present situation where the less educated men and women from this community tend to have more number of children. In contrast the percentage of Hindus in Pakistan has declined for very different reasons, the major decline being due to the mass migration away from Pakistan and Bangla Desh in the aftermath of partition. There percentage is very small, though they also face similar persecution in those countries, the comparisons are difficult. Interestingly in South Asia, the communal problem does persist, and religious majority in India suffers as minority in Pakistan and Bangla Desh. At personal note while I was working in IIT Mumbai for long years, I could see that the number of children per family is more as you go down from the professors to the peons and sweepers. Also roughly those living in Mumbai slums have higher number of children, irrespective of their religion. The situations in different countries in sub continent are not comparable on many counts. What is needed is an empathetic attitude to the deprived communities, going beyond the obvious and to solve the problem in right earnest.